Getting a soft-boiled egg for breakfast was always more exciting than it should have been…This could be attributed to not having to choke down yet another bowl of porridge or it could just in fact be the sing-along that came with it. With each strike to the side of the egg my mom would say in her singsong way “chip, chop off goes this old man’s head.” It seems quite morbid thinking about it now and if I was her I probably would have looked further into my daughter getting a high from the act of guillotining…But nevertheless, it was a ritual (passed on from her mom) that I looked forward too! To this day eggs for breakfast excite me…However, I have ventured far from my chopping head fascination…I guess you could say it has matured — into the need for a perfectly cooked medium over-easy egg. Having recently attached myself to a man who much prefers a soft-medium POACHED egg, I have put it upon myself to perfect it. Sure I could just know how he LIKES them, but true closeness comes from taking the time to show that I care about the whole process. 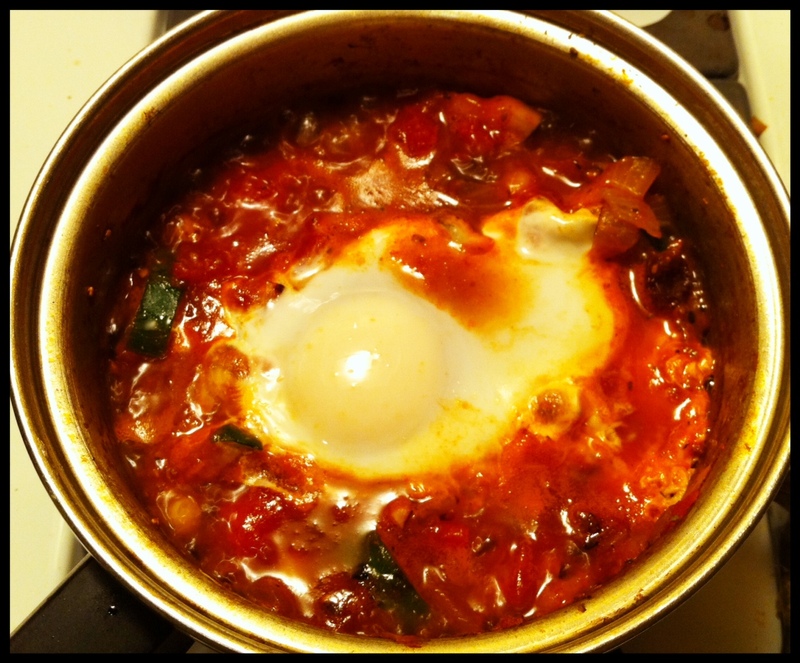 And then I remembered about a dish my girlfriend had told me about earlier that week: Shakshuka. Having little to no Israelis background in me, the dish was clearly foreign to me. But I was not going to let that get between me and my poaching perfecting so I put it to the test…By taking the beaten track off a recipe I scrounged up from the Internet. 1. 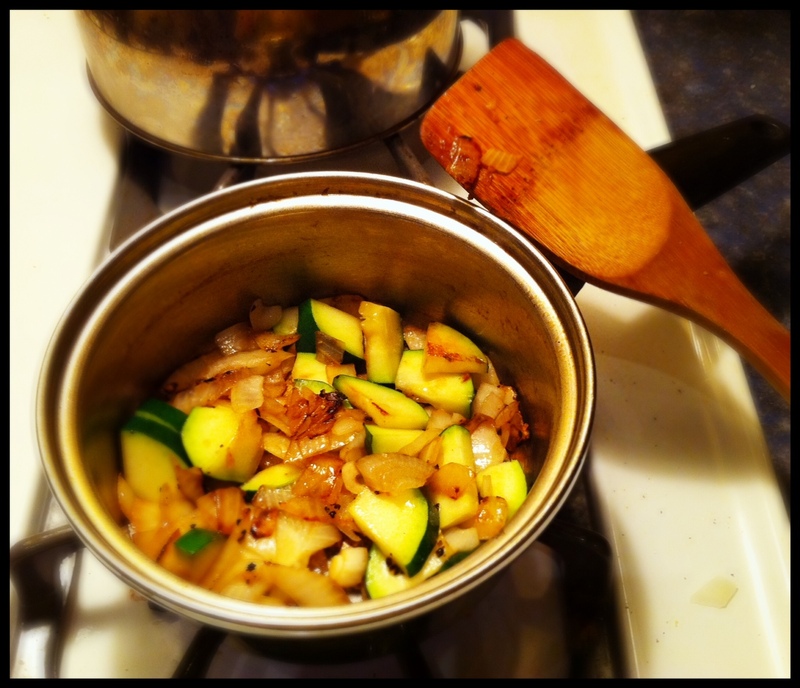 In a sauce pan on medium heat, saute the garlic, onion, and zucchini in olive oil until tender. 2. 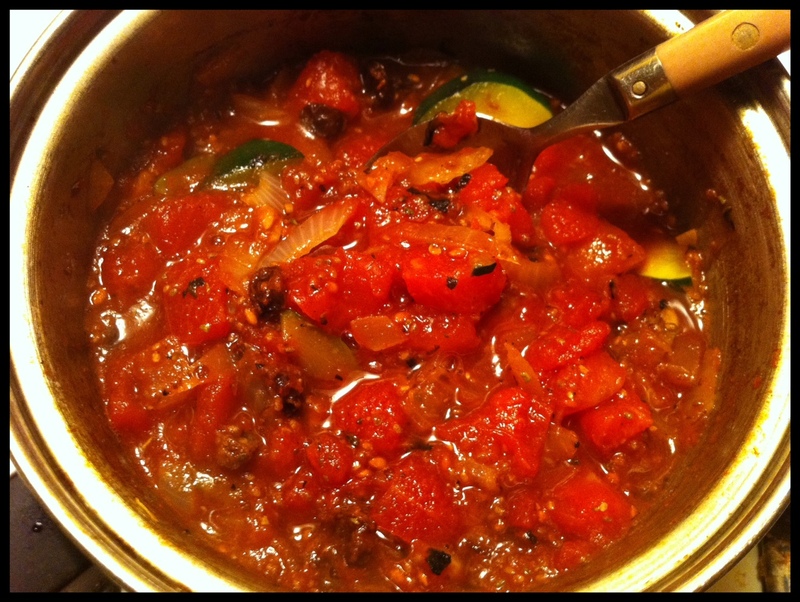 Add the crushed tomato, corn, raisins, chia seeds, and spices. Simmer on low heat until slightly thickened. 3. Crack the egg into the sauce, and turn the heat on high so that the sauce begins to bubble. Cover for about 1 to 2 minutes until the top of the egg whitens. 4. 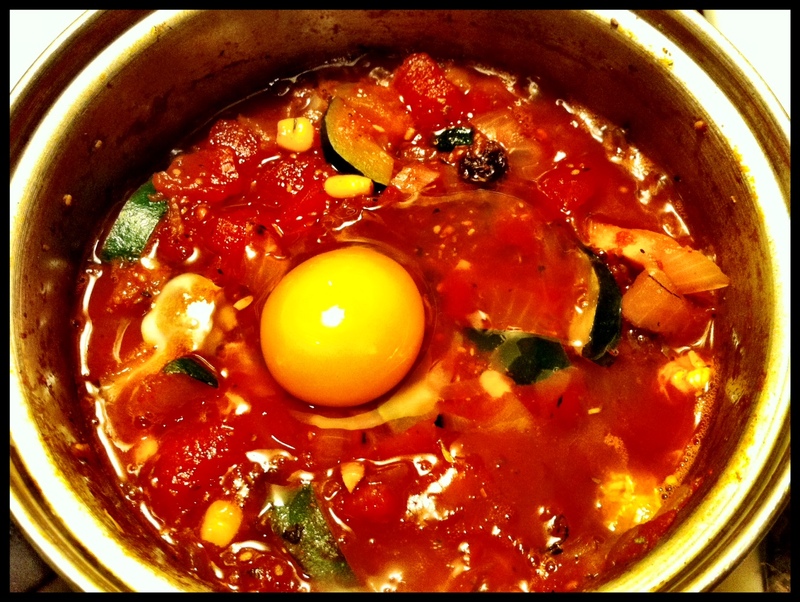 Remove the egg from sauce with a slotted spoon and set aside. 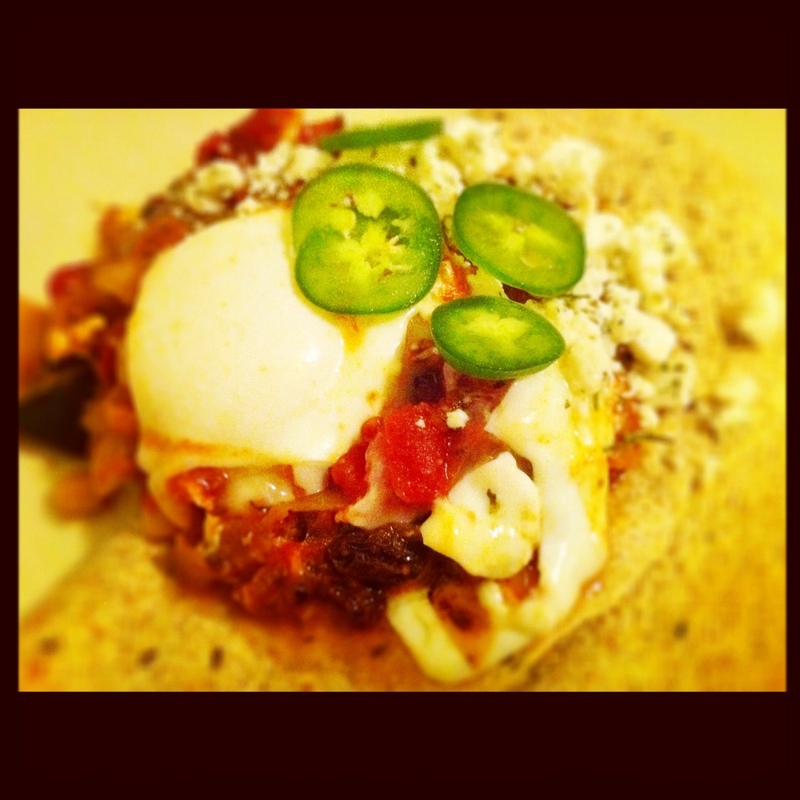 Top a warmed-up tortilla with sauce, and place the egg on it. Crumble goat cheese all over and garnish with jalapeno peppers, if using. Serve with a side salad. After much anticipation, I cut into the egg…and it was ALMOST perfect. Next time I will poach the egg just a little bit longer to ensure that I meet those soft-medium standards!